Mekong Delta is an area where boats are still the main means of transport and where rice paddies stretch as far as the eye can see. This 2 -day Mekong tour draws a picture of daily life as it happens on the river. You will visit a fruit garden, taste fresh fruits and discover local culinary specialties, especially Deep Fried Elephant Ear Fish and spring rolls. You also can join in the age-old Cai Rang floating market, where people sell fruit and farm products, namely mangos, plums, oranges, grapefruits, star apples, onions, guavas and chillies, which are peculiar to south western Vietnam. For those who love to explore the culture of the wet rice civilization, the Mekong Delta is really an unforgettable experience. especially Deep Fried Elephant Ear Fish and spring rolls. Enjoy the scenery on rowing sampan and motorized -boat. At 8 hours, you will be picked up at the hotel and transferred to My Tho. Around 9h30, arriving in My Tho, you will enjoy different types of boat trip (motorized boat trip, rowing boat trip) to islands where you can visit local houses, see how they make delicious coconut caramels and enjoy lunch. You will also stop over the Unicorn Island for a traditional music performance, “cai luong” by local people. Enjoy some tropical fruit here. Especially, you will have a chance to be on horse-drawn carriage or local transport “Xe loi” (nowadays, it is often seen on movies). In the afternoon, you will take a drive to Can Tho City, across Vinh Long, My Thuan Suspension Bridge and cross the Hau River on Can Tho Suspension Bridge. Upon arrival, you check in the hotel and relax after a long journey. Overnight in Can Tho. Today, you will get up very early for breakfast so that we will be on time to catch amazing scene of Cai Rang Floating Market. The guide will pick you up at 6:30 hours, check out and transfer you to the boat quay. Now you start a cruise to the floating markets. At 7:30 hours, arrive at Cai Rang floating market, you will take slow running for nice pictures. We will stop for a while and you can buy some fruit or contact with local people. Leaving the market, you will take another boat trip along the river bank and cannels to see how people there live, visit another orchard for relaxation. 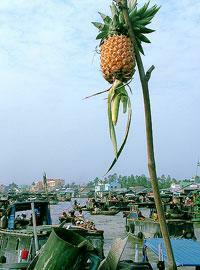 After that, you will boat to big river and have lunch at a floating restaurant docking at Can Tho River. In the afternoon, after lunch, you will have a transfer back to Saigon. On the way, pay a visit a Vinh Trang Pagoda and Dong Tam Snake Farm. This is another important element of your Vietnam tour. Our Vietnam travel consultant will offer you Vietnam hotel options based on your Vietnam travel budget and taste. **Rates vary frequently. Please contact us to get the best possible price based upon your travel period and specific touring needs. Rates based on the lowest room categories in all the hotels. Please contact us if you request for better room type or different hotel options.